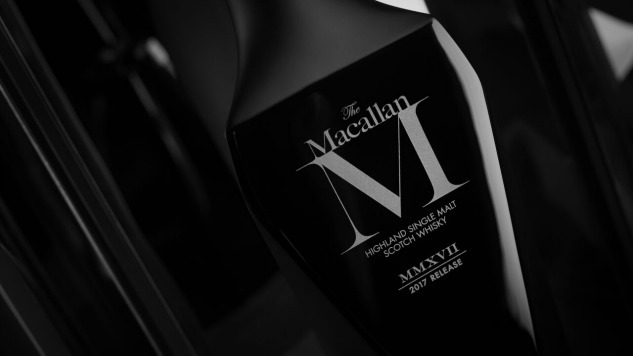 The Macallan unveiled The Macallan M Black 2017 Release Wednesday, the latest whisky in the distillery’s M series of single malt whiskies. If you’re thinking this is one you’re going to order next time you’re out, think again. Only 725 of the black decanters will be sold worldwide, only 40 of those in the United States. And they won’t be cheap. Each decanter is priced at $6,995. The decanters are made in partnership with renowned creative director Fabien Baron of Lalique and are made out of black crystal. Each one is engraved with its own unique individual number, something that is bound to make the bottles (even more) collectible down the line. Nose: Rich cherry chocolate sweetness, and fresh citrus notes with the dried fruit. Salted caramel is enveloped by whispers of peat smoke. Palate: The intensity of smoke increases but doesn’t dominate. It allows a subtle blend of green apples and citrus, dried fruit richness and smoke to perfectly combine.